If you have been active on social media at all in the last few days you will have noticed that many people are picking a word to define the upcoming year. Some refer to it as setting an intention; “I intend to be more powerful, purposeful, careful… ” and others are referring to it as a goal. That strikes me a slightly more problematic, I mean how can your goal for the year be equanimity? Isn’t that a characteristic to strive for? Or a trait to develop? It’s a nice notion, to set an intention or develop a quality you feel that you lack. It can refer to a spiritual practice or just a practical matter that you want to work on in your life. The words people pick are generally comforting and/or uplifting and are picked with the idea that your life will somehow reflect this intention. You’re meant to live it. The new year is, I guess, a natural starting place for this kind of thing but me, I just find it kind of limiting. Cherish, nourish, flourish seem to be popular (I wonder if the “ish” sound makes people feel cuddly or something resulting in the popularity of these words). I have seen deepen, mindful, transition, purpose and gratitude. Some puzzled me a bit, such as bigger. My first thought (says she who struggles with this) is why would you want to be bigger? I’m pretty sure the person was referring to a more meaningful definition; a bigger heart, intellect, generosity, things like that but my mind went right to my tush. Perhaps not the effect the word picker was going for. Dream also puzzled me. 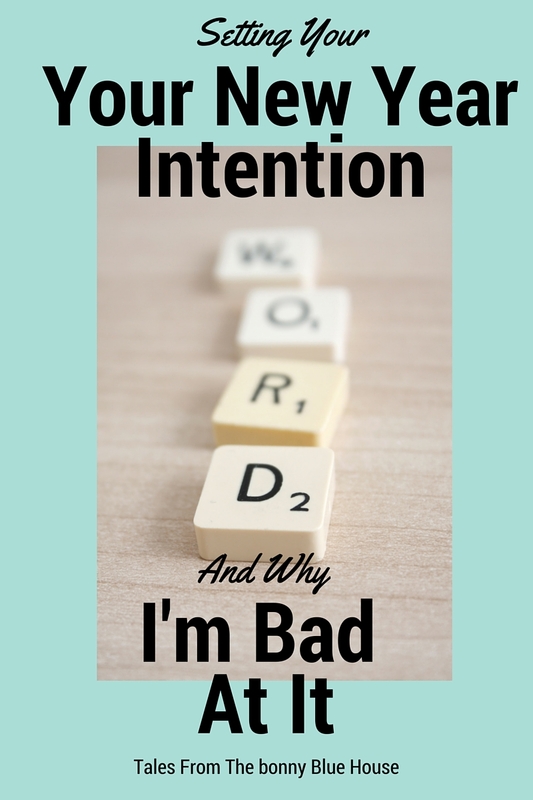 Why would you need to set an intention to dream? Those dreams that happen to us in the depth of sleep are beyond our intention setting and I always assumed it was part of the human condition to dream. Daydreams, dreams of bettering ourselves, dreams of our enemies coming to naught, that type of thing. It just happens. I am always dreaming of what I would do with all of my lottery winnings should I ever bother to buy a ticket. I don’t even spend the dollar but I dream. Oneness was a head-scratcher too. What the hell does that mean? Oneness with each other (I think of too many people in an elevator which is not my kind of oneness) or oneness with God (a laudable goal but takes more effort than picking a word). Oneness with the earth? I know this is a popular crunchy notion but it brings a picture of digging holes and sitting in them to those of us who have not given human qualities to the earth. Possibility? That’s an intention? Being open to possibility is an excellent thing but I think it might be hard to center a whole year around it as a goal. It seems more like a “I’ll do this as the situation warrants” kind of a thing. So maybe it is more of an intention. Transistion. Ha. Who isn’t says I? Life is almost constant transition, especially with a houseful of kids. You might be picking up that I’m a tad too snarky for all of this. Or perhaps it’s just that my life is too complicated for a word. One word. It seems limiting. I want to be all of those things (except bigger of course) and more. I want to be more prayerful in my decisions. I want to talk less and listen more. I want to cherish my family and friends and make known to them that I do so. I want to have gratitude be front and center in my life, because I have so much to be grateful for. I want to love deeply and without reservation, they way God intended that I should. I want my home to reflect warmth, welcome and respite, even more so than it does (if it does). I want to be more generous with my time. I want to use my time more wisely than I do (maybe those are the same things, I don’t know). I want to be more generous and spirit. A little less inclined to snark. I want to develop my intellect more carefully. To read more and think more, less internet, more writing. The fact is that these desires of mine are ongoing and lifetime consuming and I doubt I’ll master or fully accomplish any of them in any given year but I will continue to try. This list is in my journal and it is part of what I want my life to look like, it’s part of how I try to form my days and what I strive to be for my family and friends. It’s the plan for me to maybe please my God and fulfill His desire to have me with Him in heaven someday. I have a question. Why did you write a blog post about this? If you really wanted to be more generous and less inclined to snark, then why? If something doesn’t work for you, then leave it. Was the point to make those who wrote those posts feel bad? Well, the intention was to express my opinion on my blog. I don’t think anyone who chooses a word should feel bad, I just had an opinion of the efficacy of such a practice. I’m glad I read this. I thought you were talking about those word clusters that said things like “Mass”, “wine”, “love”, “family”. The one word theme is a little strange, like trying to write a paper on “the” theme of The Count of Monte Cristo. I personally dislike mindfulness. Are you a Jedi or do you not know the difference between thoughtfulness and attentiveness or just can’t decide which one to be? For you, and me, I would summarize our intention as Catholoc. Alison, thank you for commenting. As you can see the chaos has not abated since it too me a long to time to get to your comment. The twins were my sixth and seventh babies and I had an eighth two years later. Believe it or not I miss those days, we were home so much more. Now I spend most days in the car. My next webinar, in March, for HSC will be about managing distractions, from toddlers to teens. I hope you can join us. Wonderful! I love your talks. It has been very nice being home. I took every activity that required my attention off my plate when I discovered we were having twins. It has been the best thing I have ever done. I know it won’t last forever; thanks for reminding me to appreciate it while I can.